You’ll discover there are a variety of ways Mexican cooks prepare frijoles/beans. 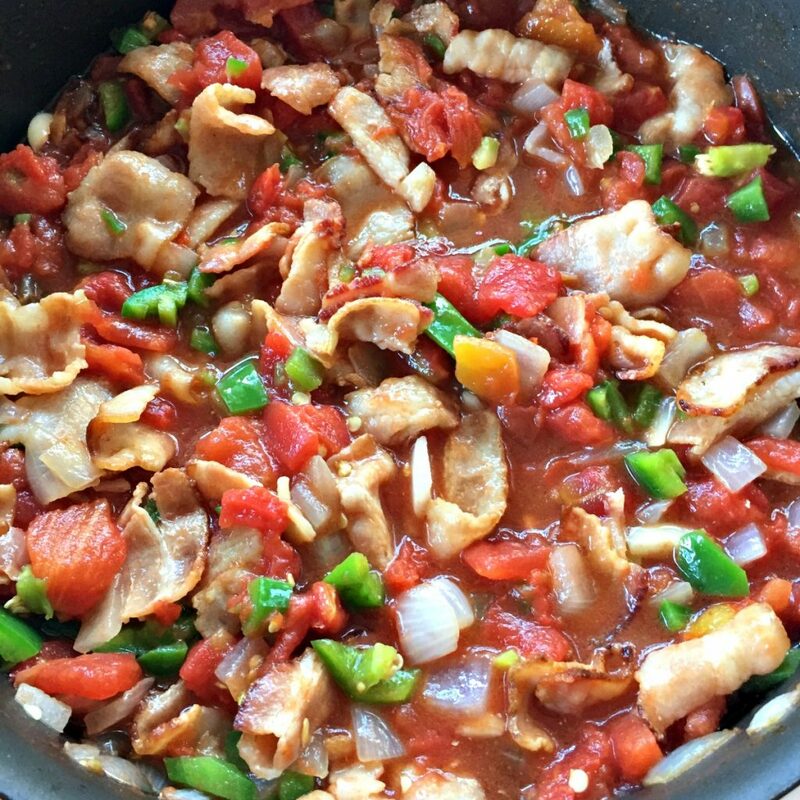 They are a staple in my household and one of the best ways I like to prepare them are with bacon or salted pork, onions, tomatoes, garlic, and a pinch of cumin. Some folks call these Charro Beans. I learned how to make them this way from good ol’ mama, but she wouldn’t add cumin powder. Wasn’t a big fan of it so that’s why my recipe just has a pinch of it. On Sunday afternoons, I’ll make a large olla of pinto beans for dinner with enough for the rest of the week. Freeze half the batch for later. The leftovers taste even better when served in the morning with chilaquiles and a fried egg on top or alongside dinner’s grilled rib eye steak. By mid-week, I’ll be adding chorizo to the frijoles or gobs of jack cheese to refry them in pork lard to make burritos. 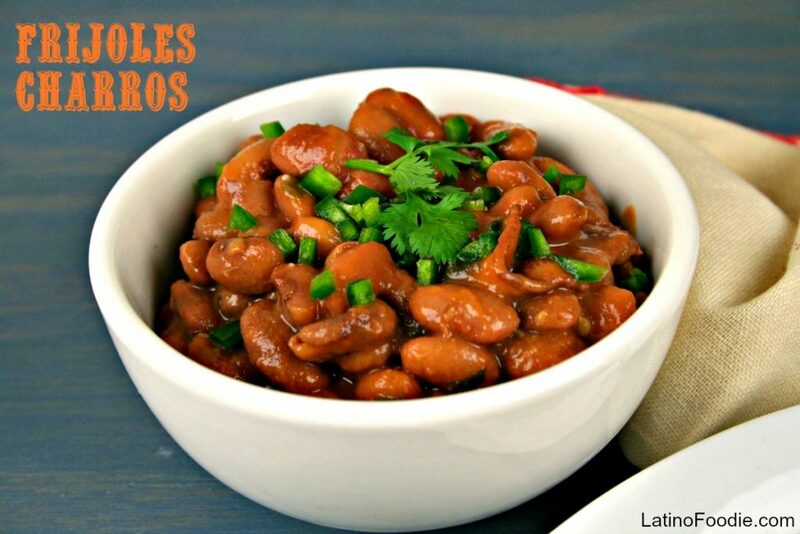 Frijoles charros are named after the traditional Mexican horsemen or “charros.” Parts of the Southwest have adopted the name and created something called “Cowboy Beans.” Other common ingredients for Frijoles Charros include chili peppers, tomatoes, cilantro, ham, sausage, pork and chorizo. It is served warm, and is usually of a soupy consistency. Unlike the gringo versions of Cowboy Beans, the Mexican recipes and versions are quite different. For starters we don’t use ketchup or barbecue sauces — at least I’ve never seen that in the Mexican charro beans I’ve eaten. When they are fresh out of the olla (heavy stock pot), I will make myself a bowl and sprinkle freshly chopped cilantro and diced jalapeños and perhaps some queso fresco, warm up a soft flour tortilla and go to town. Is your mouth watering yet? Mine is! What are you waiting for? Try this recipe and let us know what you think. 1. Wash the beans and allow to soak for about an hour. Strain the beans and put into a large, heavy stock pot. Fill the stock pot with water to cover beans by about 2 inches. Place the beans to cook over medium-high heat and bring to a rapid simmer. 2. Meanwhile, in a medium frying pan over medium-high heat, cook the bacon for about 4 minutes. Add the onions and cook until translucent about 3 minutes. Add the garlic, tomatoes with the liquid, jalapeños, cumin powder and chicken bouillon cubes, stirring frequently for about 5 minutes. 3. Add the bacon mixture to the pot of beans and reduce heat to medium-low once it is at a rapid simmer, and cook uncovered for about 1 hour. Some of the water will evaporate. 4. Add about 1-2 more cups of water to the pot, just enough to cover the beans by about 1 inch. Covered the pot and continue to cook on medium-low heat for another 2 hours until the beans are soft and creamy. Check every 30 minutes to make sure the beans have enough liquid to cook in. 5. Add salt to taste. When ready to serve, stir in the chopped cilantro. 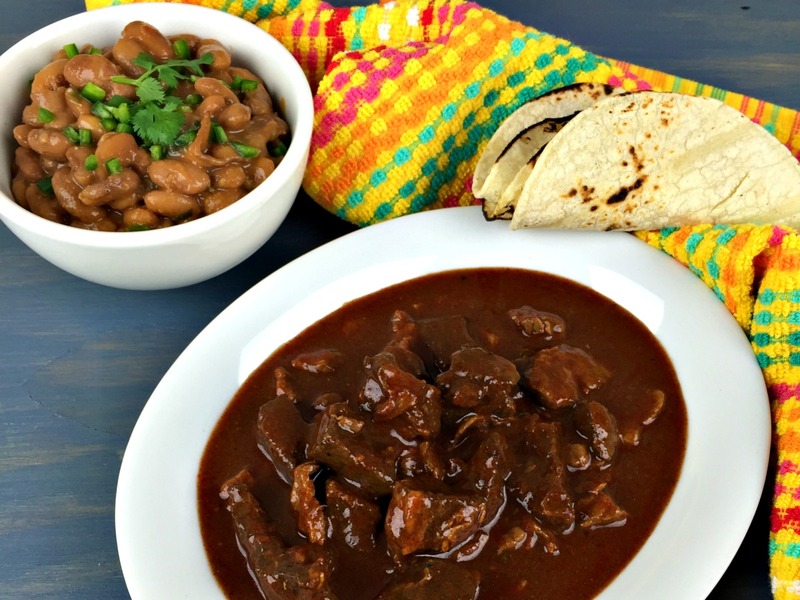 Follow the link to get the recipe for the Beef Chile Colorado pictured above. Enjoy! Second. At the end, how much liquid should remain? Also, any storage tips? Should be room temp b4 fridge?. I cooked up a pot of these a few weeks ago and they flat out rock!! My wife and I also used leftovers for breakfast adding sausage with them and filling flour tortillas. By the way…….Chile Colorado this weekend!!!! It warms our hearts that you and your wife enjoyed the recipe. Send us a pic if you’d like us to share it.